Barcelona midfielder Gomes, 25, has been influential for Everton in recent weeks as they claimed consecutive Premier League wins over Chelsea, West Ham United and Arsenal. French defender Zouma, on loan from Chelsea, has become a mainstay in defence with 27 league appearances. 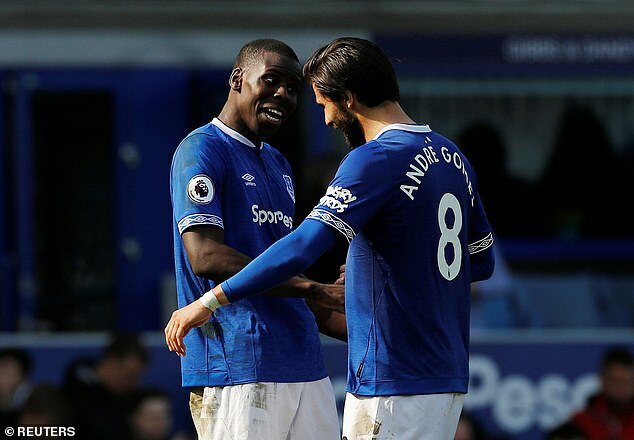 Asked if Everton, who are currently ninth in the table, could sign the pair immediately rather than wait for the close season, Silva said: ‘There’s always a chance. ‘They are happy here, which is a good sign. That means they are performing, they are enjoying it and they are helping the team also. Speaking ahead of Saturday’s trip to Fulham, Silva has hailed 24-year-old Zouma’s calming influence in defence alongside fellow centre back Michael Keane. ‘He has the qualities to be a very, very good central defender – but has all the conditions to improve too,’ he added.